Hello and Welcome to Engage! : A Family Gaming Podcast! This is episode 130. This week we are talking board games and this week Stephen and Rob are joined by the team at Runaway Parade games to talk about Fire Tower! Fire Tower is a area control and hand management fire fighting board game that is currently live on Kickstarter. It was designed and is being published by Runaway Parade Games. They took the time to answer some questions for us about their campaign. Take a look below and check out the campaign! It is currently funded and a copy of the game is only $39 with free shipping in the United States. Can you give us a “Tale of the Tape” for your game? The title, genre, playtime, age ranges, etc. Fire Tower is for 2-4 players, ages 13+ (although this is only because of certification, since 7-year-olds have enjoyed this game). The game takes 15 – 30 minutes, and is a competitive forest fire fighting game. What is the elevator pitch? Prepare for a unique experience, a relentless battle for survival packed with shocking reversals and exhilarating victories. Fire Tower is a competitive fire fighting game for 2-4 players where each player mans a fire tower in the forest. Most games about firefighting have some cooperative aspect, with players working together to beat back the flames and stem the chaos. In Fire Tower your objectives are to protect your own tower and spread the flames towards your opponents. Can you be the last tower standing? One of the main mechanics in the game is the wind, an unrelenting natural force that can be diverted but never stopped. At the start of each turn you must expand the fire in the direction of the current wind. If you find the flames encroaching on your tower, you’ll want to look to your action cards. In your five card hand you’ll find wind cards that allow you to harness the destructive force of the gale. Fire cards add a varying of patterns of fire to the board. Water cards beat back the flames. Firebreak cards that let you remove combustible vegetation to create barriers that slow the blaze. Your opponents will come after you with explosions, burning snags, and flare ups, but you can fight back by calling in airdrops of water, deploying fire engines and smoke jumpers, or constructing fire breaks. Undermine your opponent’s defenses by replanting trees they’ve removed, or douse flames on your tower with your trusty bucket. The choices are numerous; it’s up you to make the right one. Fire Tower is easy to learn, has minimal set-up time, and is intuitive to play, so that the action begins within minutes of opening the box. That said, this is not a simple game to master: multiple variables allow for a wide range of strategies, and no two games look alike. Fire Tower features a vibrant watercolor design by celebrated artist Kevin Ruelle. You can see Kevin’s fine art by visiting his website, ruellefineart.com. The Kickstarter launched April 24, 2018, and funded in 2 hours. Where are you in production/development? How close are you to complete? The game is finished, has been heavily play-tested, the artwork is complete, and the manufacturer is chosen. We have spent the past 3 years working on the game, tweaking it, paying close attention to every detail. Of course, we are open to new ideas, and we always welcome feedback from the game community, which has been incredibly warm and welcoming to us throughout this entire process. Are there any other games that you think are comparable to your game? One of our favorite things about Fire Tower is that people who play our game can never think of another game that is quite like it. There are other games about fire fighting, but all the ones we know are cooperative games. There are other games that use patterns and spatial planning to strategize, but most of them are abstract games that don’t also include the more secretive elements that come with having a hand of action cards. What we love about Fire Tower is it has a retro look and feel, but the mechanics themselves are very unique. You’re a game designer. You could have made any game you wanted. Why did you make THIS game? This is the first game that we have taken this far into the production process, so it is definitely our baby! The two of us have always loved board games and board game design, and our conversations often start with, “What if you made a game about…” and go on for hours and hours. One day we were going for a walk in the woods and we were talking about how coop games are fun because you are playing against the game, and competitive games are fun because you are playing against each other. What about a game where you are playing against both? We wanted to create an experience that ramps up over time, one where it becomes increasingly difficult to resist the building momentum of the game. A forest fire really stuck out to us as an exciting theme with a natural progression that would be both formidable and exhilarating. What was your design process like? You can always tell when one of us is really excited about a game, because they start building a prototype right away. After we went for that walk, we couldn’t stop talking about Fire Tower, and it was only a matter of days before we had a prototype built and were playtesting it. Of course, the game was very different from what it is now. The mechanics were different, the cards were different, and we were playing on this huge piece of white board that took up half our dining room. But the basic idea was the same, and after we played the game once, we couldn’t wait to play again. That’s how we knew we were onto something. We’ve been lucky to have an amazing community of gamers and designers around us as we’ve gone through this process. We can’t thank them enough for all the insights they’ve offered. The two of us kept meticulous notes on all suggestions received, and have developed a framework to apply this information. We really tried to distill player’s impressions of the game into positive change, and learned the importance of finding common ground in what at first seems like contradicting feedback. Parsing out the trends in our data led to important developments that have been essential to Fire Tower. What is the number one reason why a family MUST purchase this game? This game takes about five minutes to learn and gets everyone laughing almost instantly. It is competitive, but at the same time lighthearted. One of our favorite parts about demoing Fire Tower at conventions has been watching the interactions between families as they battle for control of the forest. We love showing this game to kids and their parents, because it’s fun to listen to their hilarious banter as they go after each other. The game also works well for families because it presents core gameplay that young gamers can easily grasp, while at the same time offering unique mechanics and strategies that appeal to more seasoned gamers. This keeps every age bracket invested in the action, and also leaves room for kids to develop more nuanced strategies over time. We wanted to create a game that was accessible to different types of learners, and tried to make it as intuitive as possible. We included cards that have both text and visual-based instructions, with a grid on each card that shows how it can be used. At one convention we met a father whose son had a hard time understanding text-based instructions and was pleasantly surprised that he found the visual directions of Fire Tower easy to digest. We’re overjoyed that Fire Tower is an inclusive experience that spans age and learning style. The social interactions the game encourages also compliment family gaming. Temporary alliances form and break as the wind changes, with players working together to send the fire away from themselves (and towards the other opponents). 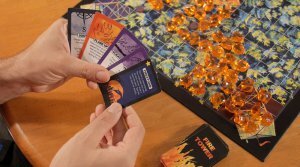 Fire Tower forces players to try to predict how others will react to a varying range of situations, which leads to a lot of interesting interplay between personalities. The game is fiercely competitive, but at 15-30 minutes a game, it’s hard to be too sore of a loser (especially when you can just play again). In the meantime, kids are learning wildfire fighting terms and enhancing their spatial planning skills. How long has this game been in development? Just about three years. We are excited to finally get the game into the hands of gamers! What obstacles did you encounter making this game? Because Fire Tower is the first game we’ve taken to the edge of production, and our first KS project, we have had to educate ourselves on every aspect that goes into making a game. Ranging from the first design concept to the final product on your shelf. It’s hard to imagine the entire process while drawing your first prototype on a piece of poster board! We want to make sure that we manufacture a high quality product that is affordable for gamers. This means spending countless hours finding the perfect component. This included waking up in the middle of the night and weighing options of card size or the shade of our fire gems. We needed to consider sizing the game box to fit efficiently on pallets, and so much more. Overcoming these obstacles has helped us create a better product. As co-designers it is hard to give up on some of your own ideas, even if you know they aren’t right. Both of us have had to learn to step back and ask, “Am I defending this idea because it truly enhances the game, or because I came up with it?”. Some of the hardest choices in the design process have been deciding when something has run its course and letting it go. Although some of these missteps end up fueling the next breakthrough! Creating Fire Tower has been one of the most challenging and rewarding logic puzzles we have ever encountered. Designing a game brings out that same feeling of exhilaration you receive when planning out a complicated move for your next turn at game night. Designing Fire Tower has turned out to be one of the most addictive games we have ever played. Where all the limitations imposed on gameplay are up to your own discretion, and the possibilities for adjustments are endless. What did your first prototype look like? Our first prototype was this monolithic piece of poster board that had five or six versions of the game board. We used a lot of different things to represent the fire gems at first: plastic golden coins with a skull and crossb one printed on one side, pennies, torn pieces of paper, and sugar packets when we were in a bind once. Our first playtesters got to pick from a pile of plastic animals to represent their towers on the board. People often argued about who got to play as the jellyfish. The first version of the firebreak tokens were ceramic tiles we found at a craft store. We had various friends with artistic skills who helped us draw the initial art on the cards. The deck was always changing! We used this setup until we’d locked down the core mechanics of the game. It was very exciting when we finally had some real artwork and were able to print a prototype through The Game Crafter. Still, sometimes we miss our giant poster board game. Why did you get into making games? Both of us have played around with game designing our whole lives. As kids we developed games that we played with our parents and close friends. At a certain point we were bouncing around so many ideas that we just had to see one all the way through. Designing a game was also an excuse to embed gaming even more into our lives. Meeting designers and playing their games has been one of our favorite parts of this whole process. Once we have Fire Tower produced and delivered we’re excited to turn our attention to other designs we’ve been working on! What other information do you want us to know about you, your company, and/or your game? Runaway Parade Games has a core mission to bring enjoyment to gamers through unique tabletop experiences. We’ve really enjoyed the process of showing Fire Tower to people at a range of extraordinary conventions including The Connecticut Festival of Indie Games, SnowCon, Pax Unplugged, Total Con, The Boston Festival of Indie Games, RetroWorld Expo, Too Many Games, Metatopia, and more. Games have been a lifelong passion for us. We’re excited to bring a new edition to a world that has brought us an extraordinary amount of joy. We’ve received a warm welcome from the tabletop world as a whole. Going forward we want to give back to the community, and share everything we’ve learned with people who are now embarking on the same journey we started three years ago. Most fire fighting games are cooperative, but in the game Fire Tower, you compete with other players to protect your fire tower from the fire and spread the fire to your opponent’s tower. There are components of hand management and area control incorporated into the game. Fire Tower is for 2-4 player ages 13 and up. Game play takes approximately 15-30 minutes. Fire Tower launched on Kickstarter April 24, 2018. Smoke rises on the horizon. A fire rages somewhere in the heart of the forest. From the height of a fire tower, you command the efforts to defend your tower and take down your opponents. With each turn, the inferno grows. Harness the power of the wind to push the blaze towards the other towers, clear tracts of land to fortify your tower, hinder the plans of your opponents with torrents of water, and unleash an arsenal of fire cards upon your foes. Each card has a unique pattern with its own tactical advantage. You must effectively direct the resources in your hand and use sound spatial planning to deploy them. First, each player receives one bucket card, which is kept face up. Next, 5 cards are dealt to each player as their starting hand, and finally the weather vane die is rolled to determine wind direction. At the beginning of each players turn they must add one fire token in the direction indicated on the weather vane die. The fire token must be adjacent to an existing fire token or the eternal flame. The fire occupying four squares in the center represents the eternal flame. The second portion of their turn each player can either play a card and draw a new one or discard as many as they want and redraw to 5 without taking any actions. This option comes in handy when there are no viable options in your hand. Player can take a range of actions depending on the card they play. There are Fire cards that spread the fire regardless of wind direction. Water cards put out the fire in a small area. Fire Break cards create areas the fire is unable to burn, but may not be added to adjacent spots with a Fire Break. One exception is that they may be placed diagonally to an existing Fire Break. Players are working to defend their Fire Tower, the nine squares in the corner of the board, and to breach their opponents. In the Fire Tower squares fire can spread, but water and fire breaks can not be used. This is where the bucket card comes into play. Players can use it once per turn to extinguish 3 fire tokens in a row, as long as one is within the tower. Once fire reaches the orange square in the corner that player is eliminated. Eliminated players give their cards to the player that eliminated them. That player adds the cards to their hand, and discards down to six cards. All remaining players in the game add a card to their hand. The eliminated player rolls the weathervane die to exact their “revenge” and causes a Firestorm. A Firestorm add one fire token in the wind direction to all existing fire. There is also one card which causes the same effect. Play continues and if there is another elimination the hand size increases to seven. The last player without a burned Fire Tower wins. Fire Tower is enjoyable and accessible. I think that players far younger than the recommended age can have fun with this. The rules and game play are easy to learn and the game play is intuitive. 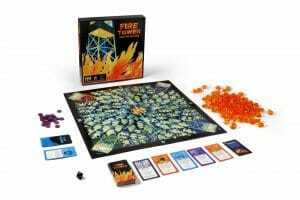 Fire Tower has core mechanics that are easy to grasp by younger players and novice gamers. Additionally, it also incorporates a depth of strategy which veteran players can find engaging. The variety of mechanics and strategy makes this game a good choice for mixed ages and various skill levels. The theme, while about a spreading forest fire and burning a Fire Tower, is not graphic. If anything the more the board fills with fire tokens the prettier it gets. The cards incorporate a description and a grid representation of the effect making them easy to understand. This is another great way the game scales down to both younger and less experienced gamers. Fire Tower is a awesome addition to any family game collection. I have played the prototype and . I was able to teach the game to new players on my second play through. The Kickstarter funded in only two hours, and there is a lot of excitement for this unique games. This is the your chance to get unique and family friendly game though Kickstarter. Restoration Games is Bringing the Heat With Fireball Island: The Curse of Vul-Kar! Restoration Games has been in business for about a year now. Their mission is to find old games that had a spark of greatness, but were held back by the state of the board game industry. They had announced three projects so far, until Gen Con 2017. They came out at the Dice Tower panel during the event to announce their hottest game yet: Fireball Island: The Curse of Vul-Kalar. The game is going to be a re imagining of the, now ancient and legendary, board game Fireball Island. It was originally released in 1986 and is remembered fondly by people who grew up in that era as “The crazy marble game.” (OK. It might just be me that remembers it that way, but I digress. )Players took on the role of explorers on a mysterious island searching for a long lost treasure. The game’s most memorable feature is its game board. It was made using vacuum formed plastic and featured Val-Kur, the volcano, at its center. I’ll never forget the commercials that showed a rad marble spitting out of the volcano and rolling down the games path wildly and knocking players to their doom. The game’s visuals DEFINITELY masked some of its flaws. By modern standards this is a roll and move game. Its hardly better than games like Sorry. We don’t have many details now, but we do know that they will be launching a Kickstarter campaign later on this year and are currently planning on a 2018 release. If you want to know more, then you can sign up here to be on the mailing list. I also recommend following their Instagram account for behind the scenes access. The Boston Festival of Independent Games is nearly upon us. Engaged Family Gaming will be on the scene with a big team and will be taking in as many games as we can. We’ve always enjoyed their Tabletop Showcase and this year doesn’t look to be any different. There are nearly fifty games in the showcase this year, but there are six of them that immediately stood out to us as games we wanted to check out. Druid Dice combines match-three puzzle mechanics with dice to create a strategy game. Each player’s army is a grid of dice that they manipulate, move, and swap to gain power and attack their enemies. This is an interesting combination of mechanics so I’m excited to see how it plays out. We love dice games at our house. The more dice we get to roll the better. So here’s hoping this one scratches that itch. Battlecats is a card combat game where players compete using a shared deck. The goal of the game is to take turns using standard deck building mechanics to “buy” cards from their own colored decks and add them to a common deck. Each turn twelve cards are laid out and both the turn order and the available actions are determined by the order that the cards are dealt. More of a given player’s color being dealt means they get more actions and the potential for more victory points. I think that sounds like an interesting concept to play around with. I’ve never played a game like it before. We actually played Fire Tower already at the CT Festival of Independent Games. But, it was so good that we can’t wait to play it again. This is a game where players compete to be the last player standing as a wildfire rages in a forest area between four fire towers. Players use a spinner to determine the direction that fire will spread and use cards to help protect themselves and attack their opponents. The gameplay was great when we first got our hands on the game, but our favorite part was the game board. It was a hand-painted, watercolor painting of a forest on a black background. It was an awesome board to play on and the fact that the art was darker added to the experience. Cake Duel is a card combat game that includes a strong bluffing mechanic. It seems like it plays like a hybrid between Sheriff of Nottingham and War. I assume that is a bit reductive, but it is a simple game. I also really liked the cartoonish art style. I have to admit that I’m terrible at bluffing games so this might be a complete bust for me. But, it’s definitely worth a look to see if my sheepie battle skills are worth anything. Re-Chord is another game that we got our hands on at CTFIG. It is a guitar-themed strategy game where players place colored guitar pics on a game board and try to score points based on playing different chords. This is a unique concept that plays well. We know that Yanaguana has been hard at work improving the game since we last saw it, so this will be interesting to check out. Re-Chord will be launching on Kickstarter on September 27th so this will definitely be an important show for them. The website for Rainbow Octopus declared that it was a game that all ages could enjoy, but that featured scalable mechanics to allows players of mixed skill levels to play together. That sounds right up our alley. It didn’t hurt that our youngest thought the octagonal, Octopus game board for each player was super cute. This is just a list of games that have us pumped though. You can read the full list of tabletop games here and make your own decisions. Sound off in the comments! The “8 and up” game category opens up a whole new realm of gaming options. Game become less “kid games” and more “kid-friendly”. At this age, reading cards is no longer a concern and the kids can handle more strategy and steps per turn. The number of games at this age level absolutely explodes and there is no way to include everything. This list includes some of our favorites, but there is so much more to play! Timeline is a competitive game for two to eight players that takes about 15 minutes to play. Player begin with at least four cards to start, and a single card is revealed. Each card is two-sided, with a matching picture on each side, however; one side has a caption describing the picture like “The invention of the Electric Iron” and the other has the year “1882”. In order to play the game players must find the correct place on the timeline for their card without seeing the year printed on the back. If you place your card correctly, it is revealed and becomes part of the timeline. If not, it is discarded and you draw a new card. A round ends when a player places their final card correctly. If any other players also place their final cards correctly that same round, a new round is played. Rounds are continued until only one player finishes a round with no cards. Dixit, a storytelling game for three to six players. It requires that you come up with a description of your own surreal card that also leaves your opponents guessing. First, each player is dealt six incredibly beautiful cards. The storyteller (active player) chooses a card and describes it with a word or phrase. Your opponents then select one of their cards that matches your description, trying to trick the other players into voting for their card. The Storytellers and the other player cards are shuffled and displayed face up. Players secretly vote for the card they think is the Storytellers using color-coded chips. If everyone guesses your card, all your opponents gain 2 points and you gain none. However, if no one chooses yours, your opponents all gain 2 points and you still get 0! Should one or more person guesses my image I get 3 points and they get 3 points, plus a bonus for anyone choosing their card. Kingdomino , the 2017 winner of The Spiel Des Jahres (The Game of the Year), combines the universal simplicity of dominoes with kingdom building. It is a tile drafting and placement game for two to four players. The game is played in short rounds. First, tiles are laid out in a field and players take turns drafting tiles based on the order of the previous round. Players draw domino shaped tiles and lay them out in their 5×5 block kingdom. only one side of their domino needs to match the land the connect to, but it can gain them more points if both sides match. The goal is to sort their kingdom so that they have large contiguous terrain (lakes, forests, etc) to earn points. Points are calculated by taking the number of continuous terrain times the number of crown icons found on any domino in that terrain. The gameplay is quick, easy to teach, and the game ages down very nicely. See our Spiel Des Jahres 2017 article here. Photosynthesis is a beautiful science-themed game that features the tree life cycle and a rotating sun to collect light points. The game plays two to four players and takes 45 minutes to an hour to play. In Photosynthesis the sun moves around the board three times and players plant and progress trees through their life cycle to collect points. The trees are three dimensional and provide a beautiful visual as the forest “grows”. Photosynthesis plays in rounds. Standard play is three rounds. Each round consists of two phases: the Photosynthesis Phase and the Life Cycle Phase. Each tree that is not in the shadow of another tree earns Light Point You then earn a scoring token based upon their location on the board, which represents the richness of the soil. The game ends after the sun makes three complete revolutions around the board. Points are then calculated based on scoring tokens and unused light points. 4 The Birds is a family board game for two to six player that is a wonderfully designed classic lineup game (think Connect4 but allowing squares as well). This game is easy to learn and fun to play and has unique elements like a ‘pecking order’ among birds, non-player crows and hawks that scatter the flock, and 6 action cards that allow players to manipulate gameplay. Each player rolls two dice on their turn to determine where they will place their bird on the tree. If a player rolls a 4 and a 2, they get to choose if they place their bird on the 24 spot or the 42 spot. When placing birds, territorial disputes are resolved via a mechanic called a “Pecking Order” and there is slide mechanic that goes into effect when birds vie for the same spot on the board. If a player chooses not to place a bird they can play one of their 6 action cards instead. Tsuro is a tile laying game for two to eight players with a beautiful Asian aesthetic. In this game you are a flying dragon. Your dragon is represented by a colored carved token. Tsuro consists of tiles with twisting lines on them, a 6×6 grid on which to lay these tiles and a token for each player. Each player has a hand of tiles. On your turn you do two things: place a tile from your hand onto the board next to your token and move your token as far as it can go along the line it is currently on. You continue to move it until it is stopped by an empty space with no tile in (yet), the edge of the board, or if you collide with player’s token. If your dragon reaches the edge of the board or collides with another player’s token, you are out of the game. The goal of the game is to be the last player left with a dragon on the board. The strategy, therefore, consists of trying to drive your opponents either into each other or off of the board while trying to extend your own route in directions that will make it difficult for your opponents to hinder your path. Roll for It! is a simple and quick dice and card game. The object of the game is to be the first player to collect 40 points by managing dice and matching the appropriate dice to the cards in play. The game players two to four, however by purchasing both the red and purple sets, you can increase the number of players to eight. Game play is quite easy and takes mere minutes to explain to new players. On their turn the player completes three actions. Match it! The player then matches the results of their roll with the dice images shown on the three face-up Roll For It! cards, ignoring results that don’t match any images. Score it! Players score a Roll For It! card as soon as they’ve matched all of its die images with dice of their own color. A card is worth points equal to the number printed at the bottom. Ticket To Ride is a two to five player game with a nicely designed heavy cardboard map of North American train routes. During gameplay, players collect and play matching train cards to claim railway routes connecting cities throughout the United States. Each player is working on completing their own secret routes. If another player claims a path they need, the player needs to try and find another path to complete their route, if possible. This also adds a potential “take that” element to the game. On each turn you can only take one of 3 actions: draw Train Car Cards, claim a Route between two cities on the board, draw additional Destination Tickets. The object of the game is to score the highest number of total points. Points are earned from completing routes, and lost for incomplete route cards. Each round allows for players to plan, think strategically, and make tactical decisions. In Dragonwood players take on the roll of adventures traveling and defeating creatures, collecting items to help on your adventure. This all occurs while players deal with events cards as they come up and ultimately earning the most victory points. Dragonwood incorporates set collection and hand management and is for two to four players. At the beginning of the game five cards from the Dragonwood deck are laid out in a landscape. These cards include the magical creatures, enhancements, and events. On their turn players may draw an adventurer card or try to capture a card from the landscape by striking, stomping, or screaming. Players collect sets of adventurer cards and can play them to earn the number of dice equal to the number of adventurer cards they use. Players then roll to see if they can roll a total number equal or greater to the number on the card for the attack they selected.The game ends once the adventure deck has been played through twice or the two dragons in the deck are captured. The player with the most victory points wins. Go Nuts For Donuts is a card drafting and set collection game for two to six players where players are trying to collect the best donuts to eat. Since there is no sharing in this game, player are bidding on the different donuts available in the donut row. Players bid in secret and at the end of the bidding only those donuts with a single bidder are collected. This brings in an element of strategy with bidding. The most desired cards often receive multiple bids and can not be collected. Each kind of the 21 kinds donut ( and two beverages) has either points it gains you, an action you can take immediately upon retrieving the card, or both. The kinds of donut cards available to players increases with the player count. The game ends when there are not enough cards to complete another round of bidding and the player with the most points wins. Sushi-Go takes place in the fast-paced world of a sushi chef, you must be the most creative and the fastest of all to be the best! The game comes in a cute tin and plays two to five players. Players start with cards in their hand based on the number of players, and select one card to play before passing the rest of their cards to the next player to choose from! The game plays in 3 hands, where all but dessert cards are cleared from the table and scored at the end. The strategy of the game lies in making the most of the cards passed to you, while trying to stop opponents from making the combinations they need to maximize points. The most interesting dynamic of this game is the chopsticks. They are played in one round, and used on a subsequent turn to play two cards at once from the current hand. The chopsticks get passed on to be used by someone else. As is, Sushi Go! is a fun game to play with your children or even with your adult friends, even if you don’t like sushi! Sushi Go Party takes the best of Sushi Go and adds more. It plays two to eight players,and comes in a bigger tin that shows off more cute sushi rolls. The main gameplay difference is that players spend the first bit of the game choosing which cards to include in the deck that everyone drafts. There is no established rule in the book for determining which cards are selected either. The rule book includes eight deck suggestions, and players can come up with their own interesting combinations. Monopoly Gamer is a must see for any Nintendo fan. Nintendo elements infuse through the game, and the gameplay is vastly different. Power-ups give players the ability to collect coins, force opponents to drop coins, and move forward. Coins replace the paper dollars, and are used for everything. Passing Go now has player activating Boss Battles, and these Boss Battles will reward the victor with additional coins for the end of the game, as well as some fun treats like a free property, or stolen goods from an opponent. With all of these added features and a significantly faster pace, Monopoly Gamer feels like a game Nintendo and Parker Brothers can be proud to have their names on. The ability to add additional player characters is also a great way to add replayability to this one. Potion Explosion is a game that will fit right into any household dominated by Harry Potter fans. Two to four players take on the role of wizards who are trying to make potions. They take turns pulling marbles out of an (ingenious) game board to collect resources. If marbles of the same color are touching when they pull out their first marble, then they get those as well. Both the look of game board and the matching color component is very reminiscent of mobile matching games. The concept is straight forward and the puzzle-like mechanics will keep everyone engaged. Players work to complete two potions at a time on their “work station” , and earn points for each complete token. Once players complete the potion components they have the option to “drink” them potion. Drinking the potion give the player a single use ability. Using up all the skill tokens or the potion cards ends the game. Points earned from completing potions determines the winner. Attacking Aliens, Rampaging Lizards, Giant Robots, Mutant Bugs, and Ferocious Gorillas: this game has them all! King of Tokyo is a game for two to six players that combines a board game, a dice game and a card game. You play as one monster whose main goals are to destroy Tokyo and battle other monsters in order to become the one and only King of Tokyo! At the beginning of the turn, each player rolls six dice. The dice show the following symbols: numbers 1, 2, or 3 (representing Victory Points that can be earned), a lightning bolt (representing Energy that can be earned), a heart (representing Healing), and a claw (representing Attack). The player with the most Attack dice goes first (the fiercest). Each turn consists of 4 steps: rolling and re-rolling the dice, resolving the dice, buying cards and using their effects, and the end of turn decision. The fiercest player will occupy Tokyo, and earn extra victory points, but that player can’t heal and must face all the other monsters alone! When you add in cards that can have a permanent or temporary effect, like growing a second head, body armor, nova death ray, etc., you get a VERY exciting game. In order to win the game, one must either destroy Tokyo by accumulating 20 victory points, or be the only surviving monster once the fighting has ended. Food Fighters is a 2 player game. This game is a player elimination style of game with some fun dice rolling mechanics as well as a bit of card drafting and component collecting opportunities. The rule booklet is fun and well laid out. The game mechanics are clear and well balanced(though the power cards initially felt uneven, further game play changed our opinion). On their turn, each player completes three actions- a) Roll for Beans or Swap fighter tiles or Attack b) Spend Beans to buy a tool from the pantry c) Allow opponent to repair their formation. After these actions are complete, play passes to the opponent. The ultimate goal is to be the first player to knock out three matching enemy fighters. This is great strategy battle game that plays quickly and is easy to learn and explain to other players. Azul is an abstract game for two to four players, and won the 2018 Speil De Jahar. Players are working to replicate the design on their board. At the beginning of each round players select tiles from a factory display represented by circles with four tiles on each or the center discard pile. Players each take one design and discards the rest to the center pile. The selected tiles are placed in pattern lines. There are one to five spaces for tiles in each pattern line. Extra tiles are placed on the floor line and score negative points at the end of that round. Players score points as they place their tiles. Adjacent tile or completing a column or row on their “wall” earn additional points. The game ends when one or more players have completed a row by the scoring phase of a round. Zombies Keep Out is a cooperative games for one to six players. Like all cooperative games there are MANY ways to lose and only one way to win. Players must collect parts and build 3 contraptions while facing nearly insurmountable odds as each player’s turn increases the urgency of the situation! The interesting dynamic that Zombies Keep Out has that sets it apart, is that the player who draws the aptly named “Terrible Things” card must choose between 3 options of many possible occurrences that do their title justice. As the game progresses. “Terrible Things” become “Terrible, Horrible, No Good, Very Bad” Things. The pool of zombies (it is actually a literal swimming pool full of zombies) depletes, and the option of being bitten becomes more and more probable. Biting adds a very kid-friendly scale of terribleness. The bitten player looses the ability to speak normally and their decision making is increasingly hindered with additional bites. Any bite past the third will turn you into a full fledged Zombie, groaning continuously. This game is immensely enjoyable and the cartoonish characters will be a quick favorite of most children. Zombies Keep Out is basically the answer to the question on all of our minds: what happens after Pandemic? The game is simple. Hanabi is the Japanese word for Fireworks, and you are pyrotechnicians who have accidentally mixed up all of the parts of your fireworks display and now — THE SHOW MUST GO ON! You have to work together to create the best display you possibly can despite your myriad of mistakes! The kicker is, you can’t look at your own hand! Your teammates can give you limited information about your hand as their turn, but if you misunderstand and play the wrong firework, it can be disastrous! The game is immensely challenging, and really makes you consider every move! While the recommended age is 8+, this game mechanic seems to lend itself to older players. It requires patience, reading your team-mates and figuring out how best to convey half (or less) of the picture to your fellow “fireworkers”. Hanabi teaches simple strategy and teamwork in a somewhat high pressure environment where you don’t have access to all of the variables at play. In Santorini players take on the roll of builders to create beautiful towers with two to four players. On each turn, players move one of their two builders to an adjacent space. Players are then required to build on a neighboring space. Players are trying to complete a three level building and have a worker standing on top of it. The first player to accomplish this wins the game. Buildings may be complete it with a dome, and that blocks players from placing their worker on it. Santorini also incorporates god and hero powers into the game in the form of Greek gods and heros. These god card allow for special actions or a change in win conditions. The god cards add a unique variability to the game. Carcassonne is a medieval France themed tile laying and area control game for two to five players. Players are trying to build features and have their followers (meeples) on features to score points. Players take turns taking a tile and placing it against a matching feature, such as city, road, and fields. There are also monasteries, which sit in the middle of fields. Players score points for: completed roads, completed cities, surrounded monasteries, and completed fields. When players run out of tiles the game ends and players get partial points for incomplete features. Carcassonne is well know for its many expansions and versions. The current base game now include two mini expansions: the River and the Abbott. At the time of this writing the Z-Man Games website had 8 expansions for sale. There also is a big box versions which contains the base game and 11 expansions. Additionally, there are three stand alone games with different settings and themes. In Pandemic, two to four players take on one of several roles, such as Medic, Dispatcher, or Researcher, in their quest to cure 4 diseases before time runs out and humanity is wiped out. Game play follows a standard turn-based approach. Each player starts their turn by drawing from an event deck to determine where the newest infections are. Then, they use location cards to move around the globe, treating diseases to prevent outbreaks. Finally, they draw more location cards to restock their hand. If a player can get three location cards of a single color and can get to a lab, they can create a cure. The cure that won’t immediately eradicate the disease. Rather, it will make the disease easier to treat. There is one way to win (working together to cure all 4 diseases), and multiple ways to lose (running out of time, being overwhelmed by diseases, etc.) Players can change the difficult by increasing the starting number of infections. Finding games that are the right fit for children aged 5 to 7 can be challenging. As they move into school age they can begin handling more in games. Young children who are just learning to read or are beginning readers are often not ready for games with lots of reading or complex turns. Attention spans still tend to be short so game duration is a relevant factor. Some game in this age range are part of a movement in the game industry to make simpler versions of their games. Ticket to Ride, Catan, and Stone Age have tapped into this age by creating “my first” or “junior” versions of their games. Outfoxed! is a cooperative game deduction game for players ages 5 and up and for two to four players where the players are…chickens. Chickens chasing clues to catch a fox that has absconded with a prized pot pie. What family can resist working together to solve such a heinous crime? The game includes a special evidence scanner to rule out the different fox suspects by showing if the thief is wearing a particular object. On each players turn they declare if they will Search for Clues or Reveal Suspects. They then have three chances to roll the dice to get all three dice icons to match their choice. If they success they complete the stated action, but if not the culprit moves closer to escaping with the pie. Too Many Monkeys A Totally Bananas Card Game is a playful, lively game is designed to appeal to young gamers and parents alike. It is a fast paced, simple game for ages 6 and up and for two to six players that subtly reinforces math concepts such as number sequencing and probability while still allowing kids to be silly and have fun. Too Many Monkeys is played in a series of rounds. Players are dealt out 6 cards face down. Players draw from the discard pile or the draw pile and swap it face up with a card in the position that matches the number on the card they drew. The winner of the first round gets dealt one less card at the start of the next round. All other players have the same number as the previous round. Play continues as above with players’ hands getting smaller each round. You continue in rounds until one player is down to just one card and draws the number 1 card (with Primo asleep). When that happens, Primo is back to sleep and the game is over! Slamwich is a fast-paced, silly, and energetic card flipping game reminiscent of Slapjack, War, Uno, etc. The game is recommended for ages 6 and up for two to six players. Taking turns, each player takes the top card of their deck and flips it onto a center pile. If a set of criteria is met, players race to slap the pile. The combinations are easy to understand. A Double Decker-If the flipped card is identical to the card directly underneath. A Slamwich– If two identical cards have exactly one card in between them (like a sandwich). Special cards like a Thief or a Muncher add unique criteria and help to make winning more random. If a player runs out of cards, they are out of the game. Whoever collects all of the cards wins. Super Tooth is, at its core, a matching card game for ages 6 and up for two to four players. Players collect matched sets of plant eating dinosaurs. Each turn includes a “landscape” of three cards on the play area. First, the player resolve event cards, such as the egg that lets the player bring back a card that had previously been discarded. Next, they player feed or chase away meat eaters, and then ultimately choose one type of plant eater from the board. Super Tooth relies a little on luck, but it is important for players to choose cards carefully to build matched sets and not just random cards. Players cash in matching sets of cards for tooth tokens, and the more matching cards the more tokens they earn. The first player with 3 tokens in a three or four player game wins, and 5 tokens in a two player game wins. Flashlights and Fireflies is a board game version of flashlight freeze tag for two to five players. The game plays in three quick phases per round, and the game ends when one player reaches home. The board includes three sections; the woods, the firefly field, and the path home. Flashlights and Fireflies plays in rounds, and each round include four phases: hide, catch, shine, and sneak. Flashlights and Fireflies is a great game for the whole family. The game moves quickly through each round and takes about 20 to 30 minutes to play. The age recommended is 6 and up, but since there is no reading in the game it does scale down nicely to slightly younger players. Toasted or Roasted has you building the campfire and trying to toast marshmallows without them becoming roasted. It is for two to four players and is recommended for ages 6 and up.There are several objectives to complete in Toasted Or Roasted. First, each player needs light their campfire by playing a Fire Starter card. Once you play a Fire Starter card you flip your Firewood Disk over to the campfire side. Then, each player needs to try and toast 3 marshmallows to win. Toasted or Roasted is a great light family game. The game has minimal reading so it can easily scale down to players even younger than the recommended 6 years old. Roasting a competitor’s marshmallows is a light “take that” element. Young players need to be able to handle it if someone “spoils” their marshmallow. Hoagie is a fast paced game for two to five players that is recommended for ages 5 and up. Each player is trying to build the perfect sandwich without any part getting spoiled by three oogies (pictured on the spoiled food and special action cards). Hoagie’s gameplay is very easy and takes just minutes to learn. Each player is dealt a hand if 6 cards to start the game. On each players turn they play a card from their hand on their sandwich or an opponent’s. Several actions with the cards can occur, but only one can occur per turn. In order to win, a player must begin their turn with a perfect sandwich, which consists of bread, meat, cheese, lettuce, and bread. Tenzi is a super simple dice game for two to four players ages 7 and up that is very fast-paced. This is a great icebreaker, boredom buster, or introduction to kick off a bigger game night. The game is noisy, quick, and simple. The variations within the rules make it something that has a high replay value. It’s also nice the game does a tiny bit of teaching while still being fun. We found that it’s been playable by children as young as five while still being entertaining to adults. Iello games has produced a series of games based on classic children’s stories and fairy tales. The games look like beautiful hardbound storybooks with classically illustrated covers and spines. Each game takes about 20 minutes to play through and they all have different mechanics and designs. They and are designed to be played by players ages 7 and up. Ice Cool is a flicking game about penguins in a frozen high school. Players take turns flicking their penguin pawns through the halls. The goal is to get your pawn through open doorways to catch fish and earn points. This is more complicated because each player takes a turn as the hall monitor who’s objective is to catch the other players. Ice Cool is more fun than I expected and the kids love it. The game board designed allows for some really interesting trick shots like flicking your penguin pawn so that you have a decent spin going and having it travel in an arc through multiple doors. You can even try to send your penguin OVER walls if you like. Roller Coaster Challenge is a single player STEM game focusing on engineering for ages 6. It come with 60 challenge card in a range of difficulty. The player sets up the posts and required pieces on the challenge card. They then need to design a roller coaster that travels to the bottom successfully using some of the additional posts, 39 tracks. The roller coaster is successful if the roller coaster car makes it to the end. This was a Toy of the Year Finalist in 2018. Laser Maze Jr. is a single player logic game designed for ages 6 and up by Thinkfun. This game challenges the player to set up tokens to match a challenge card. The player then adds mirrors to the board. The objective is to reflect a laser beam so it lights up the rocket (or rockets with more difficult cards) light up. The player selects a challenge card. There are four levels of play: easy, medium, hard, super hard. The 40 numbered cards get progressively harder as they move within each level of play. The player selects a card and inserts it under the Game Grid. The card shows the locations of the Rocket target and Space Rock Blockers. At the bottom of the card the additional pieces needed to complete the challenge are displayed. The player then manipulates the additional pieces around the Game Grid in order to reflect the laser. The challenge is successful once the Rocket Target is lit up by the laser beam. Rhino Hero is a competitive 3-D stacking game for ages 5 and up and is for two to five players where players are building a tower of cards and moving Rhino Hero up the tower. This dexterity game directs players were the wall cards need to go on each turn. Players have wall and ceiling tiles. On their turn, the player first builds the wall in the place indicated on the ceiling tile and then place their ceiling tile. Actions indicated on some of the ceiling tiles and those benefit the player, such as skipping the next player. The game ends when the tower fall, a player places their last roof card, or all the walls are built. Rhino Hero- Super Battle is the sequel to Rhino Hero. The game is for ages 5 and up and plays two to four players. This game adds three more superheros: Giraffe Boy, Big E. and Batguin. The walls now come in two sizes; tall and short and there is a superhero medal. Additionally there are spider monkeys which attack. The gameplay has additional steps they includes: 1. Build!, 2. Spider monkey attack (place a spider monkey hanging from the floor if there is a spider monkey symbol and see if it makes the tower fall), 3. Climb the skyscraper! by using a die to determine how many floors to climb, 4. Super battle if two superheros are on the same level, 5. Superhero medal goes to the players if their super hero is the furthest up at this phase in their turn, 6. Draw another floor card. The game ends when all or part of the tower collapses or all the floors that are playable have been used. Monza is a racing game for ages 5 and up and plays two to six players. Movement of your race car in this game is based on rolling six color dice. Players must utilize strategic thinking to use the colors you roll to plan the path for your car. Players can only move to a forward space and may not enter a space with an obstacle. This game is more thoughtful than a straight roll and move because you need to plan your path based on the colors you roll. With a luck roll and good planning a player can move six spaces. Any die that do not correspond to a color ahead of the player on the board are discarded for that turn. The first player to the finish line is the winner. Brandon the Brave is a tile placement game for ages 5 and up for one to four players, where you are a knave desiring to be a brave knight like “Brandon the Brave”. Knaves prove their intuition and skills by completing tasks. To do this players place field tiles and are trying to match colored crosses. These crosses represent a location of a completed task and the color needs to match one color of the task card. As players lay tiles a jousting arena may be build. The player who places the sixth tiles completing the arena gets to place a task card in the center. The game ends once a player completes all their task cards or all the field tiles are placed. Coconuts is a dexterity game for ages 7 and up for two to four players where you are launching coconuts with your monkey and trying to land them into baskets in the center. When you land a coconut in a basket you get to place the cup on your game board. To win you need to collect 6 baskets and stack them into a pyramid on your board, but there are not enough baskets in the center for everyone to collect. You need to try and steal from your opponent by landing a coconut in their basket. An added component is the basket are red and yellow. Should you land in a red basket you get to take a additional shot. The Magic Labyrinth is a memory and grid movement game for ages 6 and up and plays two to four players. In this game you are playing apprentices that have lost various objects, which are now in the Magic Labyrinth. The twist is there are invisible walls! Players must move and remember where the wall are when they or a competitor hits a wall. A series of wooden blocks in a grid under the gameboard create the walls. The walls are movable so the maze can be different each time you play. The pawn is magnetic and a ball sticks to it. If you hit a wall the ball falls off an rolls to one of the trays on the side and you go back to the start corner. At the beginning of the game players draw a few lost objects tokens and place them on their corresponding picture throughout the maze. A players landing on the space with a token they get to keep it. A new token is then drawn out of a bag and placed on the board. The first player to collect five objects wins. Enchanted Tower is a hidden information/deduction game for ages 5 and up and is for two to four players. The princess is captive, locked away in a tower by the wizard. The board sits inside the box with compartment so the metal key can be hidden under the board. There are token covering the compartments. Players are either playing the wizard or the prince and they are trying to get to the key first. At the beginning of the game the wizard hides the key in one of the compartments. The players take turns rolling specialty dice which have a player color corresponding to the pawns and number of spaces to move for each color. The wizard (blue) has to start on a lower track and has eight extra spaces to move than the prince (red). This advantage evens the playing field since the wizard player knows the location. When a pawn lands on the space where the key is under, it clicks against the magnet at the bottom of the pawn. Once a player finds the key, they try it in one of the six keyholes of the tower. If the princess pops out they win. If not the wizard hides the key again and players start over. First to free the princess wins. A popular game which has been simplified for younger gamers is Catan Junior. This is a route building resource management game for ages 6 and up and is for two to four players. Like the original Settlers of Catan you are collecting resources based on the numbers that come up with each roll. These resources used to build or get Coco the Parrot cards which provide resources or the ability to build at no cost. Instead of building settlements, cities, and roads in the full version you are building pirate ships and hideouts. The first player to build seven pirate hideouts wins. Ticket to Ride: First Journey takes the formula of its predecessor and strips out several of the more complex concepts in favor of a streamlined experience that can be played by kids who are even younger! We have always said that the Ticket to Ride series was accessible to savvy kids, but this new version is even better.The map is simplified also. The game board is large, and the various cities are larger and more defined. Each of the cities includes a colorfully illustrated image associated with it. The winner is the first person to finish six routes. This game teaches players the general flow of a game of Ticket to Ride without the burden of some of the finer details of the senior game. My First Stone Age is another popular game simplified for younger children ages 5 and up and players two to four players. Like the original game you gather resources to build huts, but the worker placement component is not included in this simpler game. The game has large chunky high quality pieces. On each players turn they take a forest tile from the perimeter of the board. On each tile is a resource, an image of a die, or a dog. If a player pull a resource they move to that resource space and take one of that resource. A die image indicates the player may move that many spaces along the path. A dog is a wild card and can represent any resources. If there are not any more dog tokens in the resources pile players can steal a dog from another player. Players have a field of three huts they are trying to collect the resources to buy. When a player purchases one with their resources, they flip over a new hut revealing the cost of the next hut. The first player to build three huts wins. Doodle Quest is a drawing game for one to four players ages 6 and up. In this underwater themed game players choose one of the 18 quest cards. Each card includes drawing instructions specific to the card. Players then draw on blank transparent sheets with dry erase markers. Once complete, each transparent sheet is placed on the quest card and is scored based on how each players doodle aligns with the picture. The player with the most points after 6 challenges is the winner. Additionally, each quest card has a beginner and advanced challenge side. Dr. Eureka is a logic and dexterity game for ages 6 and up and is for two to four players. It was originally published as an 8 and up game, but in later publications changed to a 6 and up game. In this game you are taking molecules (balls) in a test tube and need to combine colors to correspond to a challenge card. The dexterity challenge is you can not touch the balls and cannot drop them! The round ends when one player has their molecules match the formula exactly, and they call out “Eureka”. That player gets the cards, but players do not reset their test tubes. The players begin the next round with the configuration the ended the previous round. This game is great for multiple ages and skills because you can scale the rules to add challenges for more advanced players, and eliminate rules as needed. There are also several variants that add different challenges to the game. Cauldron Quest is a cooperative game that will fit right at home in any house full of Harry Potter fans. It is for players 6 and up and plays two to four players. Players are working together in Cauldron Quest to brew a magic potion that their kingdom needs to break a magic spell cast by an evil wizard. They do this by trying to move special barrels of ingredients from the outside of the board into the cauldron in the center. This might SOUND easy, but the evil wizard is trying to stop them by putting magic barriers in the way. Players need to get the correct three ingredients to the center before the wizard blocks all six paths. A Beginner’s Guide to Fortnite! How to Play the World’s Biggest Game! Fortnite has taken the gaming world by storm. Gamers of all types are joining the craze as it is playable on PC, Mac, PS4, Xbox One, Nintendo Switch, Android, and iOS. With often 300,00 viewers or more on Twitch, Fortnite is currently the most popular title in gaming. If you’re looking to jump into the action, our beginner’s guide to Fortnite will make sure you hit the ground running. There are a few aspects of Fortnite which set it apart from any other game. In almost all other Battle Royale, FPS, and Third Person shooter games, players only need to work on their skills with weapons. In Fortnite however, building and gathering resources are just as important as weapon skills. You may be thinking this sounds intimidating and that Fortnite might be too complex for your family. Fortunately, we are here to help. Our Fortnite Beginner’s Guide will be broken down into two main sections: The first focuses on farming materials and building beginner level structures, with the second part focusing on the early, mid, and late stages of the game. Fortnite has three types of materials: wood, stone, and metal. Each has a different purpose and different in-game statistics. Wood has a five-second build time per panel, with 200 health, stone has a 12-second build time, with 300 health, and metal has a 20-second build time, with 400 health. Wood is the most commonly used resource, as it is used for exploring and fast cover. Stone is better used for when you have time to build a fortification in the mid-game, and metal should be used exclusively in the late game, as it is the only material that can withstand a blow from an RPG (Rocket Powered Grenade). Materials are gained by swinging your pickaxe at various targets. One thing many new players miss, in spite of its importance, is the blue circle that appears on screen when you are attacking a resource. 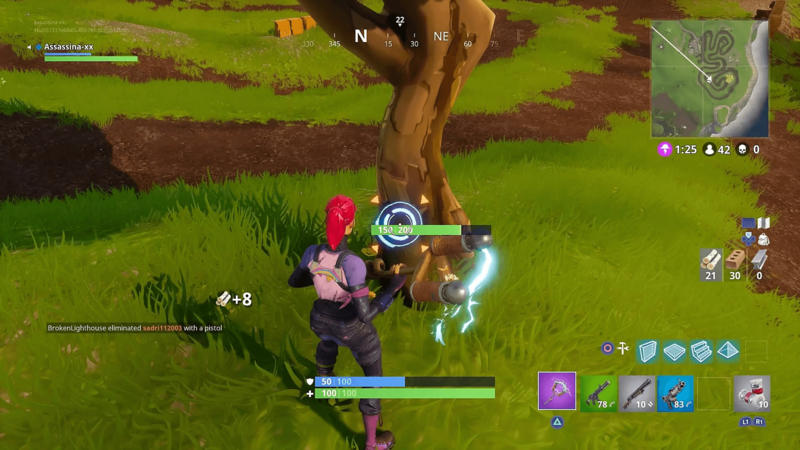 Swinging your pickaxe where this circle appears acts as a critical spot and striking near it will yield more materials per swing. 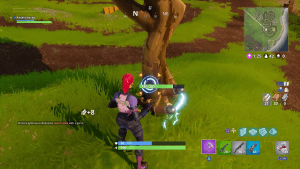 The easiest way to strike the circle is to start in the middle of the tree or structure, then moving straight down with your mouse or thumbstick. Using this tactic, you will hit the blue circle almost every time. It is always important to have enough materials to build when the situation calls for it, whether exploring or when being fired on by an enemy and protection is needed. Being caught out in the open without enough materials to build cover is often a deadly mistake. This is why farming materials efficiently is a crucial skill for any new Fortnite player. When moving from one area to another, always be aware of your surroundings and plan your route accordingly. You should not stray too far out of your way to farm a single tree or area. Instead, try to choose the path with as many trees along the way as possible. Knowing what to farm is also important, as larger trees and wood pallets provide the most materials per swing for wood, and vehicles are most efficient for farming metal. One important tip is that you should never finish chopping a tree completely, as a disappearing tree is a dead give away of your position to potential enemies! Now that we know the different types of materials and how to farm efficiently, let’s go over what those materials are used for. Materials are used to build four different shapes or panels: walls, floors, ramps, and roofs. Knowing when and where to use each shape and for what purpose is key to becoming a skilled builder in Fortnite. Your first few games of Fortnite should be focused on farming materials in a remote part of the map and practicing building. With three different types of materials and four panels, you will need enough practice to where you can switch between all 12 options in a split second. Now that selecting the desired materials and panels is second nature, it’s time to learn what to do with them. Building is used for three main purposes: exploring, fast cover, and building forts in the mid to late game. Exploring in Fortnite means building ramps or floors to reach places that would otherwise be inaccessible. Common examples of these would be building a ramp to reach a loot chest in an attic or building a bridge to move between two buildings. Wood should always be used for exploring because it does not need to withstand enemy fire. Building fast cover, which is one of the most important skills in Fortnite, can be used defensively and offensively. If you are out in the open and an enemy begins firing at you, quickly build walls and ramps for cover (Wood should also always be used for this). Something important to note is that although wood panels have a 5 second build time, during the build time there is a blue indicator for the panel that will immediately obstruct your enemy’s vision. This obstruction of vision is often more important than the finished panel itself, as you will have moved to a new location before the five second build time is over. Ramps can be used either offensively or defensively. Building a ramp to run into the second floor of a building can often save your life as well as preserve precious materials because you will not have to build more panels to use for cover. Ramps are often used as an offensive tool as well. If you are moving out in the open and encounter an enemy, quickly build a ramp. Moving to the top of the ramp allows you to peek over with your medium to long range weapons and take cover when needed. A slightly more advanced form of building is combining multiple panels to form structures. There are many different sizes of structures players use. The most basic structure is known as a 1×1 structure. This is made by building 4 walls with a roof or ramp panel in the center. Most often used when out in the open, this structure provides 360-degree protection, with the roof or ramp panel allowing the player to peek over the sides. The 1×1 structure is the most basic of examples and there are many more advanced patterns that can be found online. 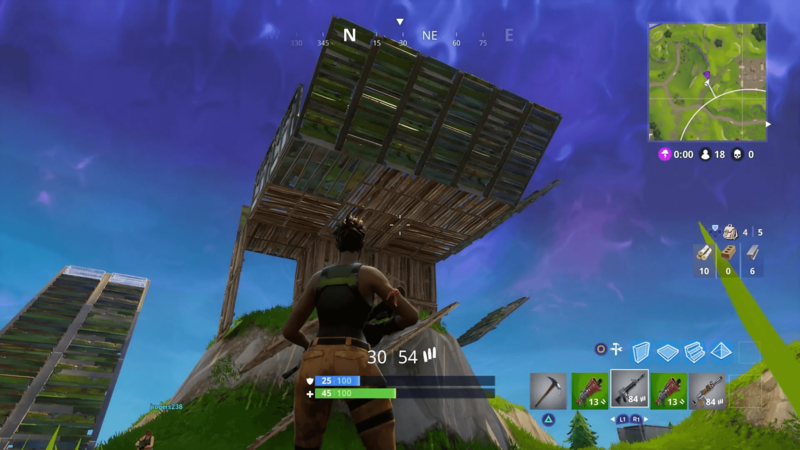 These more advanced structures are primarily used in the mid and late game, where players build extremely high towers in the ever-important battle for high ground. Fortnite has three different phases, early, mid, and late game. 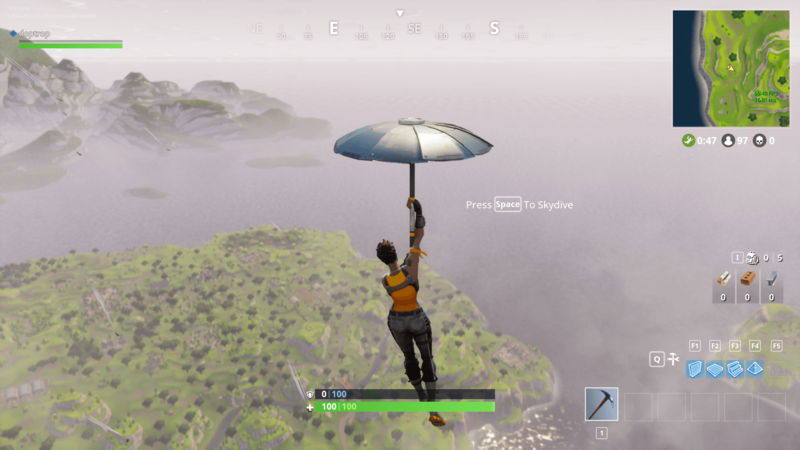 The early game is generally viewed as the time from when you first drop into the map until after the first storm circle closes. Knowing where to drop is the most important part of the early game. The named areas of the map have better loot and thus attract more players. If you’re a beginner, it’s best to avoid these areas and drop on a hilltop somewhere in a remote area that is away from the path of the bus. This way you can avoid firefights and practice building until you have a few games under your belt. When you are ready to land in the more populated areas and go for better loot, it is important to start memorizing where the loot chests are. Chests are often in the attics of buildings, which can be found by listening for their shimmering sound effect. If you drop into an area with buildings at the start of the game, you should always land on the roof and break through with your pickaxe in hopes of finding a chest. If you are lucky, you may get a good weapon at the start and get an easy kill on another player who has not yet had a chance to loot anything. You can also reach attics in other houses by destroying ceilings and building a ramp. However, you must be careful to not destroy the ceiling the crate is resting on, or the crate will be destroyed as well. If you loot a chest with a shield potion right after landing and hear another player, consume the shield potion as fast as possible before engaging. The extra health will give you a considerable advantage. Most important in the early game, but important throughout all stages, is to always be active. You should always be looking for loot, planning your most efficient path, and checking around for enemies, never move around without purpose or using materials when unnecessary. After the first circle closes, we head into the mid-game. In the mid-game any remaining players will probably have a decent inventory of weapons and shields, so be ready for a fight. It’s important to have a balanced inventory at this point. A balanced inventory consists of a shotgun for short range, an assault rifle for medium range, and a sniper rifle or assault rifle with a scope for long range, as well as some consumables. It is also important for the mid and late game to play around the enclosing storm properly. If you are in between the safe zone (The safe zone being the center circle) and the enclosing storm, you can use the storm as protection from behind. Try to move towards the safe zone as the storm closes in. However, it is possible that some players in the storm will fire upon you, so don’t treat the storm as complete protection. If you are already in the safe zone as the circle starts to close, take or build some cover and try to pick off any players moving in. These players will be caught between having to stop and return fire, risking damage from the storm, or continuing to run and being unable to fight back. This advantage should most often net you an easy kill. Also, be sure to farm some stone and metal when the coast is clear, as you will need these materials for your fort in the late game. If you have made it to this point, then congratulations! 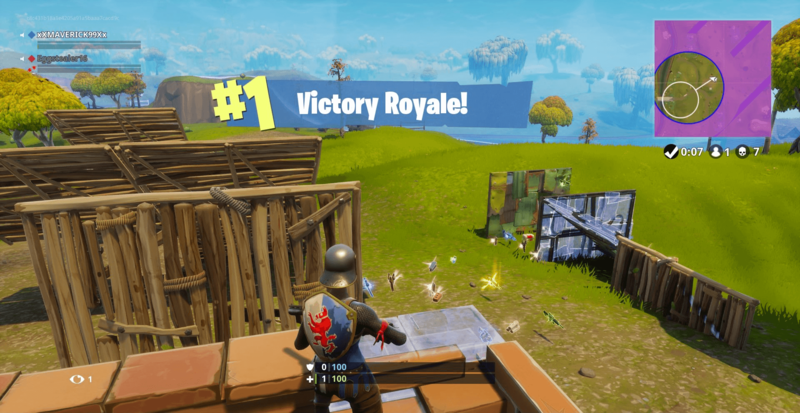 Late game is the most adrenaline pumping phase of the game and begins when there are roughly 10-15 players remaining. If you are outside the safe zone, you should focus on getting as close to the center as possible. This is important because in the late game you will need to build your final fort, and you do not want to construct it somewhere that will end up in the storm before the game ends. Constructed with stone or better yet, metal, your fort should be three to five stories high. Three stories are the minimum and should be made if you are low on materials (Be sure to keep some materials in reserve so that you can rebuild destroyed panels). If you have a healthy amount of materials, then a five-story fort is ideal. A five-story fort will usually give you the high ground advantage while allowing you to hear the footsteps of enemy players on the ground. Since every player should have a sniper rifle or long-range weapon at this point, whoever controls the high ground has the advantage. Once you have your final fort constructed, try to get a feel for where the remaining players are. As a new player going for the win, it’s best to let other players fight it out and eliminate each other. If you see two other players in a firefight, wait for one to take out the other before engaging. The winning player will most likely be low on health and an easier target. Keep moving and avoid peeking from the same spot or moving in patterns, keep your movements random to avoid becoming predictable. The late game is especially nerve-racking so keep your cool, focus, and wait for your opponent to make a mistake and you will be in a good position to take home the win. 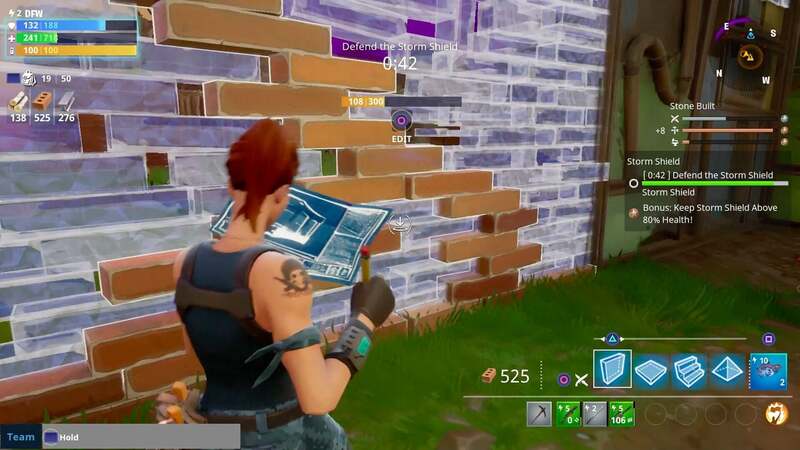 On the surface, Fortnite looks like a simple game but as you can see, there is more than meets the eye. Fortnite has many other features and advanced strategies not mentioned in this guide. Gaining confidence as you progress and learning more about the game is half the fun. As you play, try to remember in each game what worked and what didn’t. Learn from your mistakes, follow our guide, and with some beginner’s luck, you will surely be on your way to your first Fortnite Victory Royale. Board games are going through a renaissance right now. It may appear to the casual observer that hobbyist games are a new phenomenon, but that couldn’t be further from the truth. Talented designers have been designing and publishing games that can stand up to some of the best the modern board gaming world has to offer for decades. Unfortunately, many of those games fell by the wayside because of circumstances that were beyond their control. Some games were designed in such a way that they needed technology that didn’t exist yet to really help them shine. Other games had a kernel of greatness that was hidden under a pile of cliché mechanics that were considered “required” in order to be commercially viable in their day. Others were great games that served a small niche and needed the expanded reach of this internet to help them thrive. Restoration Games was founded to help find those lost marvels and give them a new life thanks to inspired game design principles, modern technology, and advanced production techniques. Every game deserves another turn and the team at Restoration Games is dedicated to finding the best ones and giving them another go. Restoration Games has four games under their belt right now. Three of them are available through online retailers and friendly local game stores (FLGS for short) right now. The fourth will be coming to Kickstarter later on this year. Stop Thief! Was original published in 1979 and was one of the first board games to employ the hidden movement mechanic. The game relied on a battery operated radio that played sounds to help players figure out where their targets were on the game board using audio clues. That clunky battery operated device has been replaced by a free mobile app that not only helps clean up the original experience, but it offers an easy opportunity for the designers to expand on the game in the future should they choose to do so. Downforce has been published before under many names like Top Race, Daytona 500, and Cleveland Grand Prix. It was originally designed nearly forty years ago by Wolfgang Kramer. It’s a card-based racing game that has been very well received by other reviewers so far. We can’t wait to get our hands on it soon. Indulgence has had quite the journey since it was originally published as Coup d’Etat back in 1966. It had a brief pitstop in 1982 to be republished as Dragonmaster. It’s a trick-taking card game where players can either follow the leader’s rules of taking the risk of undermining them for a bigger reward. This is another game that has been well received so far. It feels like the depth of strategy will be a little bit beyond our target age range, but I absolutely love the art style. The internet erupted when this was announced as part of the Dice Tower panel at GenCon 50 earlier this summer. Fireball Island is a well-loved game from the 80s that definitely could stand to be given some love. The primary feature of the original game was its massive game board. In truth, it was less of a board than it was a vacuum molded plastic island that you could play a game on. The centerpiece was a massive volcano that would spew red marbles that would roll down paths and knock over player’s game pieces. It was an interesting gimmick, and it certainly got the attention of lots of kids back when it was first released. But, I am excited to see how the team at Restoration Games will improve upon it. Restoration Games even takes suggestions! Head on over to their website and you’ll get the chance to tell them what game you’d like them to tackle next! Nintendo Made a HUGE Set of Announcements During Their Quarterly Earnings Call! Nintendo may as well have set the internet on fire overnight with the news that came out of their quarterly earnings call. They revealed a wealth of information that sowed more than a little bit of chaos onto the web this morning. I woke up to a press release with all of the news this morning. Take a look below for snippets of the press release as well as my thoughts and feelings. Miitomo has been very successful so far considering that it has already reached 10 million users with less than six weeks on the global marketplace. The fact that it has 300 million conversations started within that same period of time is equally impressive. The question still remains, however, whether or not there will be any staying power for the app. It could fall off of a cliff completely at some point. The good news for Nintendo is that probably doesn’t matter. It has already been an amazing trojan horse that has helped get a large number of people signed up for My Nintendo accounts and to get their emails into the system so Nintendo can market their other mobile titles to them. The next two Nintendo mobile games will be based on Fire Emblem and Animal Crossing. These are both amazing properties that have a lot of potential as mobile games. There are already a HUGE number of strategy RPGs on mobile devices as that style of combat is perfect on a touch screen. The press release states that it will be more accessible that previous entries in the franchise, which honestly isn’t all that tough considering the challenge level of the series. Also, there are a number of ways they could go that arent necassarily a strict turn-based strategy game. They could easily create some sort of hero focused tower defense game or a base building game of some kind. Regardless… I can’t wait. The Animal Crossing app is interesting as well. The press release states that it will be connected in some way to Animal Crossing games on dedicated gaming devices. The question just becomes… how? They could patch some sort of connectivity into New Leaf or Happy Home Designer. But, it could be a sign that a new game might be coming later this year. That could be pretty awesome! Only time will tell. I lost myself a bet here. I guaranteed that the NX would come out this year and made two bets with writers on other sites. … And I lost those bets. Honestly, though, this is not a bad idea at all. Pushing the NX out until 2017 gets it out of the way of any of the other upgraded consoles being rumored for 2016 and gives Nintendo more time to tighten the launch lineup. Delaying the new Legend of Zelda game definitely stung some fans. But, the delay didn’t sting as much as the fact that it will be simultaneously released on both Wii U and the NX. E3 is coming up very soon and it is easily the noisiest period of the year. Competition to “win” the event in the eyes of the gaming press and the fans is insane based on the number of games and pieces of hardware shown. Nintendo leaving all of their console news until after the event and leaving The Legend of Zelda to fend for itself is actually a pretty savvy move. People will be so excited to get their hands on the new game that it will definitely garner a lot of attention. They might not need anything else to dominate a lot of headlines and build interest. They can then follow up with a Nintendo Direct a month or two later with a bunch more game announcements and not even have to worry about the E3 noise.